Hosting guests for the weekend? 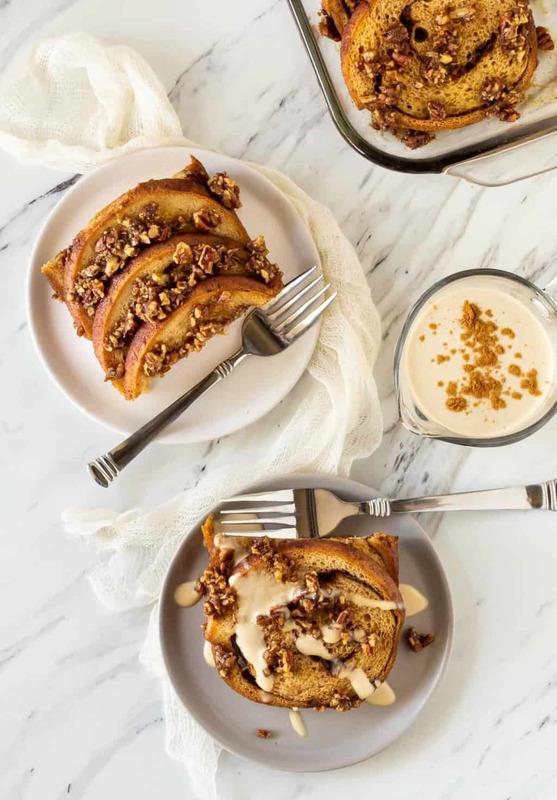 Treat them like royalty with this Overnight French Toast Casserole with Irish Cream Sauce and a crunchy pecan streusel. Nothing says you went the extra mile for your house guests like making breakfast from scratch. But who wants to be tied to the kitchen all morning? Enter this easy Overnight French Toast Casserole recipe. Some might say the best part of this recipe is the make-ahead preparation, which is fantastic if you’re hosting a houseful of family and friends. But for me, nothing beats the decadent Irish Cream Sauce that fills every nook and cranny of this overnight french toast bake. I’m not going to lie; I’m picky about my french toast. The first tip I have for making a killer french toast bake is an ideal ratio of egg to milk. Too many eggs and you have a baked egg casserole, not baked french toast. Too much milk and you end up with soggy (and kinda tasteless) bread. I landed on what I think is the optimal ratio of eggs to milk: 5 eggs for 1 3/4 cup milk mixture. I use a combination of whole milk and half and half in my overnight french toast casserole, but that’s because I love the full flavor these ingredients give the dish (and we always have half and half on hand because my husband uses it in his coffee every morning). Feel free to use just whole milk if you prefer. The second tip for perfecting your make ahead french toast bake is all about technique. I’ve never had a lot of luck with just pouring the liquid mixture over the bread slices. Some pieces end up completely soaked while others don’t get enough liquid and bake up hard as a rock. After much experimentation, I’ve found that dipping the bread pieces individually before adding to the casserole dish makes a huge difference in the final product. That’s right, dip them just like you would regular french toast that you make on the stove top. In fact, let them hang out for 30-60 seconds in the egg mixture to ensure they are sufficiently soaked before adding them to the pan. Then pour any remaining liquid over the top of the casserole after all the bread has been dipped. This little bit of extra effort results in an evenly baked casserole with no soggy or dry spots. What kind of bread did you use for this French Toast Bake? I’ve never seen a circle bread before. This Cinnamon Swirl Bread comes from the bakery at my local grocery store. It’s one of our favorites, but feel free to swap in any other cinnamon swirl bread that you have handy. My only suggestion is to make sure that it’s a firmer bread so it can stand up to the overnight soak in the liquids. Do you need to add the pecan streusel topping to this Overnight French Toast Casserole recipe? Um, no, but unless you’re allergic to nuts, I can’t imagine why you wouldn’t! I love how the crunchy, sweet pecan mixture gives a nice contrast to the softer bite of the french toast. You can even save yourself an extra 5 minutes in the morning by making the streusel the night before and adding it to the casserole right before baking. What is this Irish Cream Sauce business? Can I make it ahead of time like the rest of the recipe? 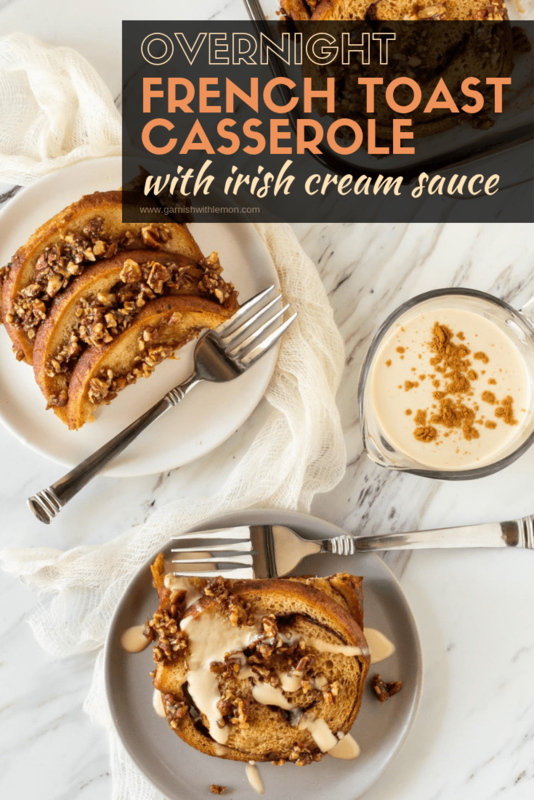 The Irish Cream Sauce is nothing more than a bit of heavy cream, Kerrygold® Irish Cream Liqueur, sugar and vanilla cooked over the stove. I love how quickly this sauce comes together with just a handful of quality ingredients. And yes, you can absolutely make it in advance. Simply store the sauce in the fridge until the morning of your brunch and then gently rewarm before serving. 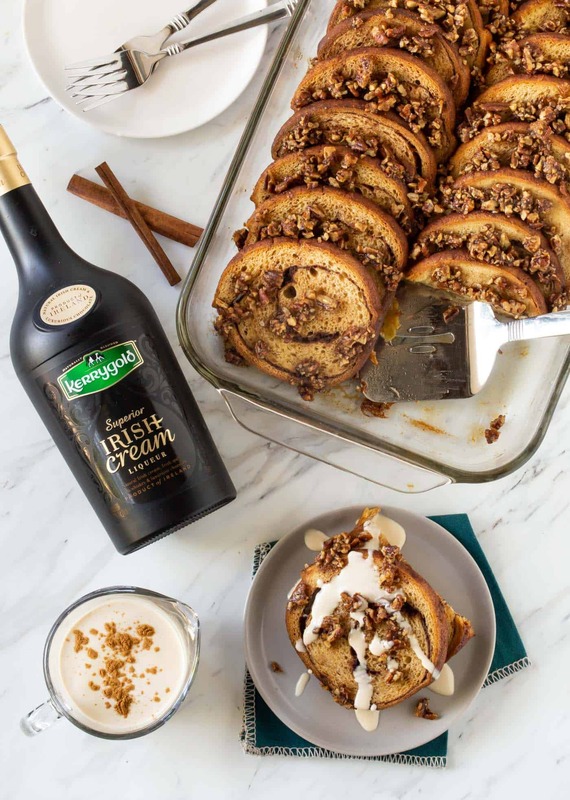 Impress your house guests this holiday season with this easy recipe for Overnight French Toast Casserole with a decadent Irish Cream Sauce! Disclosure: This post was sponsored by Kerrygold®. We only share products with you that we personally use and love. Thanks for supporting the brands that make Garnish with Lemon possible. Add a touch of decadence to your brunch plans with this easy recipe for Overnight French Toast Casserole with Irish Cream Sauce! Generously butter the bottom and sides of a 9 x 13” casserole dish. In a medium bowl, whisk eggs and then whisk in half and half, milk, sugar, cinnamon and vanilla. Submerge each piece of bread in the egg mixture and allow to soak for about 30 seconds/slice. Arrange slices in casserole dish. Pour remaining egg mixture evenly over top of bread. Cover with foil and refrigerate overnight. Combine pecans, brown sugar, cinnamon and salt in a small bowl. Cut in butter pieces until the mixture resembles small crumbs. Sprinkle mixture evenly over French toast. Bake for 30 minutes covered and another 20-25 minutes uncovered. Cut into pieces and serve with warm Irish Cream Sauce. Combine cream, liqueur, sugar and vanilla in a small pan. Bring to a boil over medium-high heat. Stir together cornstarch and water and add to cream mixture. Stir and continue to cook until slightly thickened, about 5-7 minutes. If not using immediately, allow to cool, cover and refrigerate. Warm before serving.